Bathroom flooring options vary in price and performance, however the best bathroom flooring solutions have one major thing in common, they are all moisture resistant. 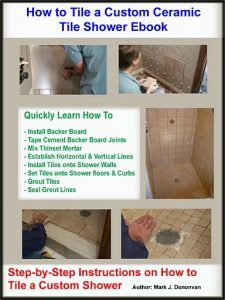 Bathrooms have high moisture levels and to use bathroom flooring types that are sensitive to moisture is a recipe for mold and mildew growth, as well as possibly rot in the bathroom. At the top of the list of bathroom flooring options is ceramic tile. Ceramic floor tiles are impervious to water damage and are easy to keep clean. Ceramic tile is also reasonably affordable and available in a plethora of sizes, shapes, patterns, colors and prices. The only cons of using ceramic tile for bathroom flooring is it can be cold on the feet, and it can be slippery. A couple of throw rugs and the use of smaller ceramic tiles, to create more grout lines, can alleviate these issues. In addition, ceramic tiles can be purchased with an anti-skid textured surface. Vinyl flooring also ranks high as a bathroom flooring option. Vinyl flooring is cheaper than ceramic tile and is easy to install. In addition, vinyl floor tiles can be installed by most do it yourself homeowners. The only cons with vinyl flooring are that it is susceptible to lifting at the edges or the individual vinyl floor tiles eventually lifting altogether. Stone is also a viable bathroom flooring option, however it is very expensive to install. Besides high material costs, labor is also expensive. This said, stone, such as Marble, Granite and Limestone are impervious to water and thus make it a good bathroom flooring option. In general, wood flooring is not the best of bathroom flooring options. Since wood is sensitive to moisture it can easily be damaged if exposed to water or high moisture levels. This said, if there is a quality sealant applied to a solid wood floor, and the bathroom floor is constantly maintained a solid wood floor can work in a bathroom. Engineered wood flooring, however, is the best wood floor bathroom flooring option. Engineered wood flooring has a real wood floor face, however the underside of it is constructed of a water resistant plywood. 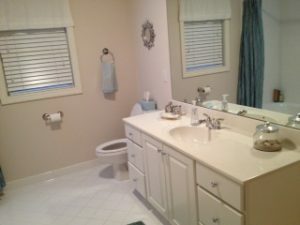 Carpeting and laminate flooring should not be used in bathrooms. Carpeting can easily absorb water and take forever to dry. In addition, carpeting is difficult to clean in a bathroom so mold and mildew growth is a very real problem with carpet. Laminate flooring is susceptible to water damage. If water gets in between the laminate seams and underneath the flooring, it will quickly swell and begin to break down. So carefully consider the pros and cons of each bathroom flooring option before making a decision, and pay particular concern to their resistance to moisture and their cleaning ability.